Let’s learn: Orfeo Soler, Las palabras del león | EASD Alcoi. 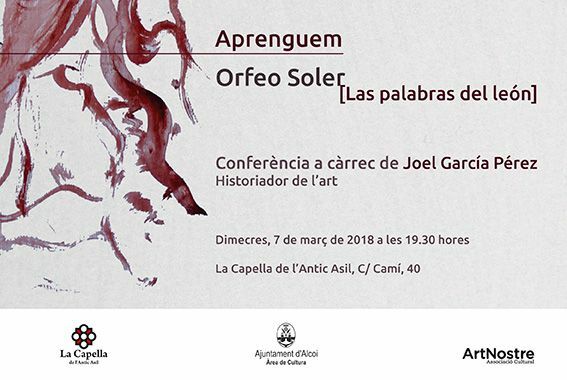 Next Wednesday, March the 7th at 7:30 pm, a lecture by Joel García Pérez, professor at the Department of History and Theory of Art and Design of the EASDAlcoi, will take place at the Capilla del antiguo Asilo (C. Camí, 40). A lecture that wants to be an explanatory approach to the aesthetic proposal of the young alcoian plastic creator Orfeo Soler. The conference is planned as a complementary activity to the exhibition entitled Las palabras del león that was inaugurated on January the 25th and can be contemplated until March the 18th to the exhibition space of the Capilla del antiguo Asilo, dependent on the area of Culture of the City Council of Alcoi. With this explanatory look at the interesting creative proposal of Orfeo Soler is intended to establish and offer the public some keys of historical-artistic interpretation, assessment and approach to the aesthetic approach of this creator as well as their sources of inspiration and their references creative. Orfeo in Las palabras del león develops a creative proposal of strong expressive intensity where the beauty of classic referent, the pain caused by Crohn’s disease and the expressive deformation of figuration coexist to generate a markedly autobiographical plastic approach. A personal proposal that must be linked historically to the approach of pain and the macabre theme as an aesthetic category initially developed by Baroque and Romanticism and to the more emotional and expressive tendency of art begun in post-impressionism by Van Gogh or Munch and continued, in the first avant-gardes, by the German expressionism and in the second by the European informalism that end up expressively mistreating the form and where, especially, Giacometti seems to act as a reference for Orfeo. Orfeo’s life experience, his emotions, his anguish and vital struggle is reflected in works that make art expression of feelings and emotions so intense that they end up distorting and mistreating the form and artistic matter. Orfeo Soler makes the expression intense art. The gestures, the shuddering, the scribbling, the trickle mistreat the pictorial form and the sculptural matter in an impulsive, angry and enraged manner. These are the words of the lion that make torn and striking expressiveness of art, the aesthetic words with which Orfeo Soler is pathetically expressed.